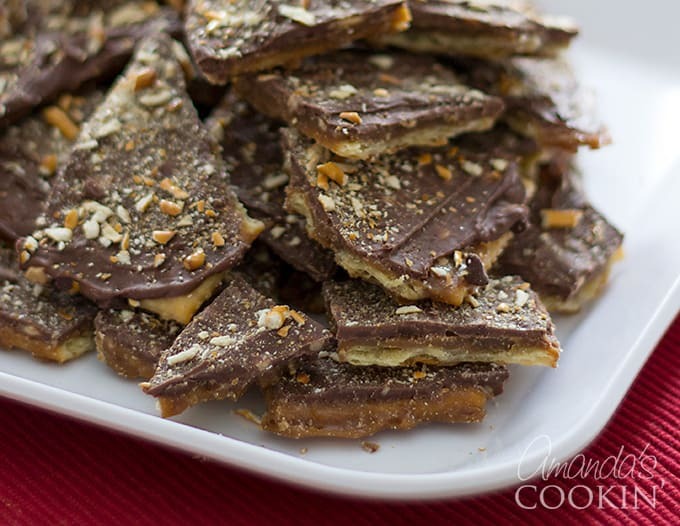 If you have never tried saltine toffee before (also known as Christmas Crack, similar to Easter Crack), I have to warn you that this candy recipe can be very addictive, just like the ever-famous Peanut Brittle! I don’t think it’s possible to stop at just one piece. 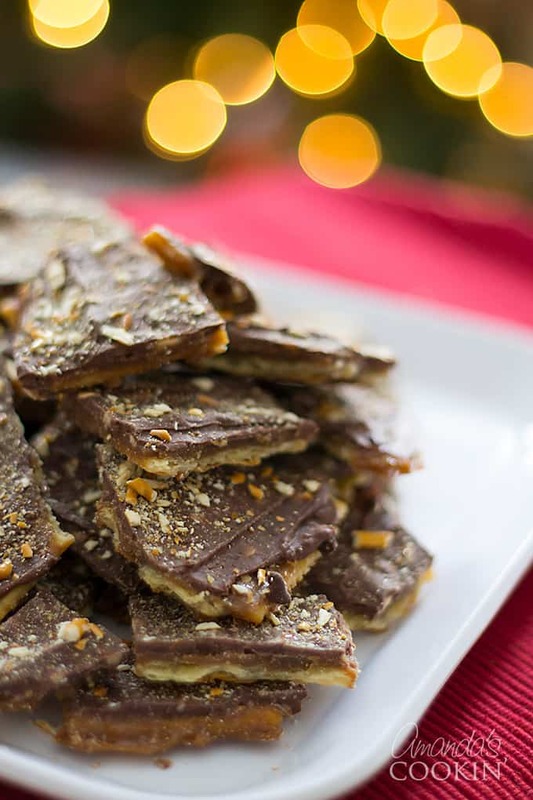 Bring this homemade toffee to your holiday gatherings and everyone will be begging for the recipe. You can also package it up in pretty containers for a delicious homemade Christmas gift! Saltine toffee has been around a long time but has really taken the Internet by storm in the last couple of years. I had never tried it before, but I was so pleasantly surprised at just how good it really is! 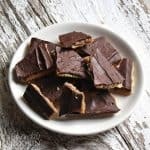 Saltine cracker toffee hits the perfect balance of sweet and salty, with a deep, rich flavor and crunchy-yet-a-little-chewy texture. It might sound like a strange combination, but trust me! This is definitely one of those recipes that is much greater than the sum of its humble parts. As usual, you can find the full recipe in a printable format at the bottom of this post. Do you have a favorite homemade candy recipe? I’d love to hear about it in the comments! Can’t get enough toffee? Try some pumpkin toffee cookies with salted caramel glaze, or maybe some peanutty pumpkin spice toffee bars! If pumpkin isn’t your thing, you can also make a batch of chocolate toffee almond shortbread bars. For a classic holiday treat, make my peanut brittle recipe. My easy pumpkin pie fudge is sure to be a hit at this year’s Thanksgiving dinner! Are you crazy for candy? You definitely need to try these easy homemade candy bars. Preheat oven to 425 F. Line a rimmed cookie sheet with aluminum foil. Fill sheet with all 40 saltine crackers in a single layer. In a medium saucepan over medium-high, melt butter and brown sugar together and bring to a boil. Boil for 5 minutes. Remove from heat and pour caramel mixture over the cracker layer. Spread with a wooden spoon if needed to cover them evenly. Bake in preheated oven for 4-5 minutes, or until just bubbly. Remove from oven and sprinkle immediately with chocolate chips. When chips begin to melt, spread them over crackers with an icing spatula. Transfer pan to refrigerator until firm, about 2 hours. Break into pieces and store in an airtight container. Mine stuck to the foil. I didn’t see where it was to be sprayed with non stick. Gonna let them sit a little from the fridge and see if them come off. At least the ingredients aren’t expensive if I have to re do them. Should I spray the foil or would parchment paper be better? Sorry you had trouble! Not sure why it stuck. Did it release after refrigerating? What happens if you use regular butter instead of unsalted?